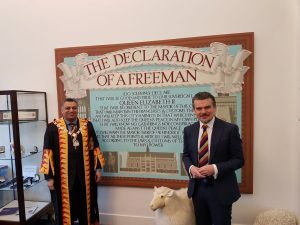 As befits a modern Livery Company, we Fuellers entered the world of social media last year and continue to experiment to find out what members and our external followers find most interesting. After a quiet few weeks, the Facebook members group burst into life with the Inter-Livery Pancake Race. Lots of good humoured banter and some great photos, including our Junior Warden’s prizewinning get-up. If you’ve ever wondered what Facebook is like and want to connect with fellow Fuellers, then do take a look. On LinkedIn, our largest company group, Liverman Michael Green keeps us right up to date with company announcements, visit reports, industry news and items that don’t make the web, like the presentation of members for Freedom of the City. Here’s the Master with our latest City Freeman Simon Brewster, CEO of innovative engine tech spinout Dolphin N2.